Question: I was recently watching television and heard something that interest me. The topic was about aging and learning your true age. I was wondering what is your true age and how can I learn my true age? Answer: Your true age is how old your body thinks it is and how old your body acts like it is. There are various factors that can affect you true age. Physical health, mental health, and weight, just to name a few, can cause your true age to be different than your calendar age. At my unhealthiest, my true age and calendar age had many numbers between them. I remember being in my early twenties, with a true age in the thirties. Talk about an eye opener. The good news is that with some dedication and lifestyle changes, your true age can change (if you want it to change). I decided to take control of the situation and now my true age and my calendar are more closely related. As a matter of fact, my true age is actually a year younger than my calendar age. There are many true age test available and keep in mind that they are all different. 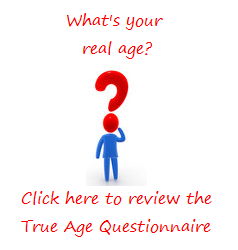 To learn your true age, you can use the true age questionnaire here. All of your answers will remain confidential. You will not have to submit your answers to anyone, so be honest so that you can get the most accurate results.